It is really dark as we leave Edwards Air Force Base. It was dark when we got there today. Over to the left glow the lights of Lancaster and to the left of that is Palmdale, California. After almost a month here I still can't believe how far you can see and how clear it is. Today, well tonight, is laundry and I must buy more batteries and film. Today's pace was go-go-go as we draw ever nearer to our departure from sunny California. First order of business was to load the forward fuselage onto Worldwide Aircraft Recovery's lowboy trailer. Two cranes lifted our Blackbird off its nosegear and Marty carefully backed the trailer into position. Worldwide's custom-built supports were positioned and the forward fuselage was secured. The back fuselage is still attached and that too was mounted on supports and the main gear tires removed and the gear legs secured. Then the right wing and nacelled were surgically cut in the firststep to make the Blackbird road-transportable. 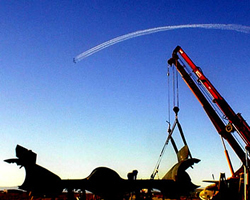 During all this heavy-lifting the Edwards Air Force Base Airshow was going on. The acts had been practicing all we so we were pretty inured to the passing show until the cry of "Blackbird!" rang out. It was one of NASA's Blackbirds and it thundered into the sky with a NASA F-18 flying chase. It curved to the right away from us and quickly disappeared from sight. It was a sight to experience because in five years or less the Blackbirds will stop flying forever. The schedule of events for the show called for a Mach 3 sonic boom flyby at 10:45 am. That would be a half hour later so we went back to work. As that time drew near I walked off into the desert armed with two cameras. The digital wouldn't pick it up but I hoped to catch it on the museum Nikon with a telephoto lense. Out in the desert the noise of the work-site compressor faded away and it was quiet. I could hear birds and the occasional muted squawk of the air show announcer as if in a dream.As the minutes passed my ears were on high-gain seeking any hint of the Blackbird. The sky was a perfect blue and my eyes swept 360 degrees looking for a contrail or a fast moving black spot but to no avail. I was looking down adjusting the Nikon when the sonic boom hit. Startled, I looked up and saw no Blackbird. I did see three puffs of vented fuel where it had been nanoseconds ago. I immediately tracked the course-line indicated by the puffs with my binoculars but again saw nothing. I could hear cheering in the far distance. The weekend passed quickly. It wasn't the Edwards Air Force Base Air Show though we saw every new aircraft in the inventory pass over. It was the final separation of our Blackbird into the last of its component parts. The last separation involved crawling up into a fuselage fuel bay gummy with gray sealant and undoing all the nuts and bolts that hold the aft and the forward fuselage together. Very carefully the big Kenworth tractor pulled the two sections apart and then it was a matter of clean-up and securing the forward fuselage to the lowboy trailer. Airshows are meant to be combed for VAM applicable resources though and I did force myself to walk the line looking for visiting aircraft to grace the ramp so kindly made available to us by the Capital Region Airport Commission of Richmond International Airport. Found a couple of possibilties there and also scored some information on the possible availability of SR-71 pressure suits. 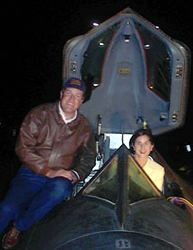 Talked to SR-71 pilot Brian Shul about the availability of his books which have several pictures of our Blackbird. The best part was meeting VAHS Hall of Famer Scott Crossfield of X-15 fame again. He always looks right at home at Edwards. The sad news is that Saturday's SR-71 sonic boom I heard may be the last one ever. There is talk of possible future missions but this may be the end of an era. It was awesome to the end. Most of the weekend though was the final tedious chores preparatory to attaching SR-71 parts to tractor trailers. As we were coming to the end of the day the United States Air ForceThunderbirds arced over show center, went to smoke and framed our Blackbird. Monday morning finds our disassembly area thick with tractor trailers. Ben Natrass personally supervises the loading and securing of each valuable part of our Blackbird. The truckers confer and double-check routes, permits and memories. There will be five tractor trailer loads all of them officially "wide loads". It turns out there are degrees of wide loads and the routes to our museum are different depending on the degree of wide load. Retired Lockheed engineer Torrey Larsen who has been with the Blackbird since its beginning secret days is on hand to document the departure of another of his godchildren with a digital video camera. The first three trucks launched at mid-day today which is Monday. Ben Nattrass plans to launch early Tuesday morning in one of the two pickups and the last two tractor trailers and the remaining pickup will leave midday Tuesday. These last two tractor trailers carry the fuselage and are the "media" trucks. I left Edwards Air Force Base Monday at sunset. The desert is still beautiful. Tuesday is a combination clean-up the disassembly area, pack tools and return assorted rentals. Ben Nattrass checks the last two tractor trailers to make sure everything is just right. 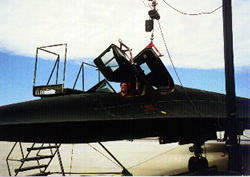 The forward fuselage which is the part most recognizable as being "Blackbird" is especially scrutinized. This truck is the "media" rig. Having already spoken to V.A.M. 's Executive Director Mike Boehme this morning Ben gives the remaining crew its marching orders. Then he climbs into his large GMC pickup and departs for Virginia. The different widths of each wide-load truck when loaded dictate different routes. Now that four of what now will be six trucks have departed Ben has to beat them all to Virginia to scout out the museum for a secure reassembly area and line up support equipment. It will be a marathon drive which he will accomplish solo. By mid afternoon everything is returned, secured and packed. It is time to roll. We are two tractor trailers and another large red GMC pickup. The two diesel tractors rattle into life their drivers carefully inspect the rigs and their loads one more time. I'm in the GMC which will be the Blackbird's chase across the U.S.
We pass over the dirt road access to closed runway 30 one last time coating everything with another layer of dust. Once on the macadam the trucks pick up speed and I can see passing cars craning to look at the Blackbird as it leaves Edwards Air Force Base forever. Today's run will be short as the target for today is Barstow, California. This short shake-down run allows us to put the loads on the two trucks to the test of highway speed. In the "chase" GMC we formate on each truck looking for signs of anything coming awry. Everything stays put and none of the straps flap. Tomorrow - all road, all day. It is o-dark-thirty in Barstow, California. The target for today is Albuquerque, New Mexico over seven hundred miles via our wide-load route. The diesel engines are running and our orange rotating beacons are on reflecting off near-by signs. The walkaround inspection of the trucks and cargo is complete. We are waiting for the sun since we are restricted to daylight hours only. I am riding shotgun with Marty who is driving the 1978 Kenworth tractor hauling the forward fuselage. Buddy has the other rig while Jim has the red, GMC,pickup. The other four rigs are scattered across the southwestern parts of the United States depending on the width of their respective loads. At the first sliver of sun Marty picks up the microphone and radios "Rock and roll guys". We are off! Days on the road are long. We pass through desert on I-40E from Barstow and through the East Mojave National Scenic Area. When we exit California I can imagine the Blackbird shuddering as we pass by Kingman, Arizona. Kingman is where many a worthy surplus aircraft went to be smelted. As we climb up into Flagstaff, Arizona the scenery starts to green and real stands of trees replace the occasional scrub trees we saw in the California desert. We also see two beginning forest fires at a distance. Especially interesting are the long cold flows of igneoous rocks signifying volcanic activity. Historic Route 66 parallels our route as do the longest freight trains I have ever seen. The sun slowly describes an arc over our heads as the miles go on and on and on. At our only break of the day to refuel I get earplugs against the roar of the wind and the truck. We pass near Meteor City where one of Earth's best preserved meteor impact site calls to the passing tourist. As we finally draw closer to the Continental Divide west of Albuquerque the most remarkable scenery of the trip begs for the camera. I promise myself to read up on southwestern geology when I get back to Virginia. One never stops learning. The sun begins to drop to the western horizon and our target is close at hand. We get there, pull in shut down, examine the loads and find tonight's motel. The next few days will be all road, all day. We gotta do what they say can't be done. We gotta long way to go and a short time to get there. We're east bound just watch ole Bandit run. The Blackbird is certainly east bound. This could be the longest overland journey of a SR-71. 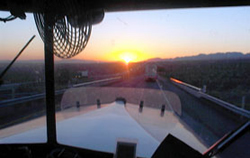 To avoid "burning daylight" as the Kenworth's driver Marty puts it we are checked out of the motel, packed, fueled and ready to pull on to Interstate 40 as soon as the first hint of the sun appears. Down below us to the east shine the morning lights of Albuquerque, New Mexico. Now that the sun climbing into view the Kenworth is spooling up through the gears as we pull on to I-40E. 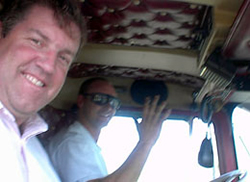 Jim flies "chase" in the red GMC pickup. Marty and Jim are both fueled by coffee so they are both on the step as we surf the big rig through early morning traffic. We desperately want to avoid rush hour traffic because we have to make time. The staff of Worldwide Aircraft Recovery have traveled most of the major arteries of the United States but such concentrated doses of road travel are still novel to me. This will be the first time I have ever followed an Interstate from end to end. We started I-40E in Barstow, California and will finish it in Asheville, North Carolina. From there it is up I-85N to I-95N to 295N to I-64W to the Museum. This knowledge does not serve to shorten the trip however. I watch the sun describe another arc from the east to the top of the sky. At this point we refuel the rigs while other drivers at the pump assure us the Blackbird won't run on diesel fuel. We are east of Amarillo and have left the western mountains and hill and run into the rolling flatlands as we begin our long descent to the Mississippi River still a day or two off. The sun lazily drifts through the rest of the arc before diving below the horizon. We have completed New Mexico, rizona, Texas and most of Oklahoma. Tomorrow is another early launch. At four a.m. the expected call comes. Word of the SR-71 Blackbird's passage had traveled up and down I-40E by the trucker grapevine. Calls were made and Molly Doherty of Oklahoma City's KFOR Channel 4 set up an interview by the Blackbird before our normal o-dark-thirty departure. Molly showed up in the KFOR news van and while its antennae was being run up Marty got in the truck and positioned the Blackbird under an outdoor sodium-halide lamp in the parking lot for better illumination. Molly's professionalism made the three interviews newsworthy and informative. For the rest of the time we are in Channel 4's viewing area people pull up and tell us they saw the interview with the Blackbird in her morning report. They also pull alongside- photograph, pull ahead to overpasses- photograph and generally keep the citizens band transcievers humming the progress of our passage. We talk back and wave from our truck windows. The miles roll by, the sun describes another arc overhead and the countryside finally becomes less Great Plains-like and more rolling with stands of pines, deciduous trees and even underbrush again. It was just yesterday that we were watching tumbleweeds blow across the road. I notice with some surprise, although I know it is October, that the leaves are changing. Not that many leaves to notice in the deserts we've traversed. We pass through Oklahoma, Arkansas and approach the legendary Mississippi River. Our day is coming to a close ecause we cannot drive a wide-load after dark. We have to cross Old Man River and find a place to park for the night. 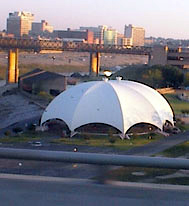 The bridge across the river appears and we cross only to see another famous airplane parked under a white parachute-like cover down to the right. It is the famous B-17 "Memphis Belle" of World War II fame. The "Memphis Belle" is celebrated for being the first bomber to successfully complete 25 combat missions over Hitler's fearsome "Festung Europe." We cannot stop and press on but I remember my friend John Mitchell who died unexpectedly this week while I was away. He was my favorite volunteer at the Virginia Aviation Museum dating back to my beginnings there. The B-17 he flew in World War II was named the "Jeannie Bee". The sun passes below the horizon once again and we park the Blackbird for the night twenty miles east of Memphis, Tennessee.